A great deal, but now...? I have been given permission to get a larger tank for the living room and I will get it for my birthday! The only condition is that my current 125 litre goes integrally (without fish but with all the plants and decor) to the office. In return I will get a 20 gallon with rocks and some low light plants. Sounds great, doesn't it?! The question is now what size to get and how to use it best. I have about 1.60 metre (5 feet) of length. As far as I know this is not a regular length for a tank and custom built is too expensive. What is my best option in terms of size? I should be able to get a nice stand for it as it will be a display tank. Regarding the use of the space I also have a dilemma. 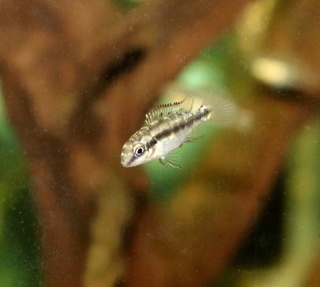 I like small fishes, notably Asian egg scatterers, anabantoids and cories. 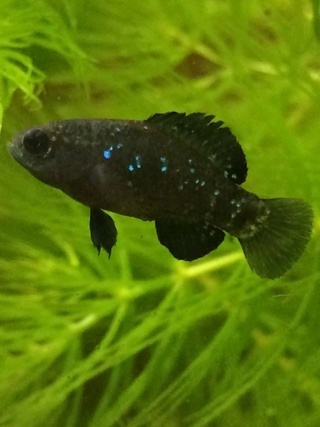 Keeping several species of anabantoids together in one tank could be a potential problem or would selected species be able to have separate territories in the same tank? An option would be to put a temporary divider in an island scape with an island on each side of the divider. Would this look good from an esthetical point of view? Re: A great deal, but now...? If you have a Petsmart in your area they carry a 5 ft 120 gal aquarium set up. 5 foot tanks are not uncommon. 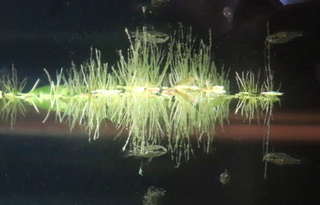 If you scape it properly and plant it, several Anabantoids would be easy together, Generally, you would have to stick with the smaller ones, and avoid the more common ones. That's not snobbery - the fishfarms are breeding the popular species larger with hybridization, and using a lot of hormones to jack up the colours. That leads to short lived, aggressive fish. Plus the larger species (blue gouramis, etc) can be nasty. If you are petsmarted where you are, you won't ever find good ones, but if there are good stores in your area, you should be able to collect a few small Anabantoids over the course of a year. I've seen real honey gouramis, croakers, Betta Imbellis and 2 or 3 others around locally, and they'd get along. That is good news! I currently have vittatus, mahachai, and wild colour honey gouramis. Apart from the fancy bettas of course but I only have plakats. Ok, it is pretty official now: 5 foot tanks are being phased out and no longer available unless you want the tall version. Marineland is the only one that still makes the 5 foot but with a height of 26 inches! That is way too high for me; I think even with a stool it would be difficult for me to plant and maintain it. So, now I have 2 options: get a 75 gallon (4 foot) or go with an European sized aquarium of 150 cm (5 foot is around 160 cm). The only store that carries it here in Mtl though has packages with very cheap stands and flimsy hoods.... They say they import from Italy but somebody told me it is all Hagen stuff. I wish I had your dilemma Biulu I have a 75 I could set up if I move my other big tank over about a foot just can't convince the wife to let me. Aquatica in Montreal used to have a 5 footer as a standard. I'm surprised that has gone out of style. The 75s are nice, and another size that is good for smaller fish is the four foot 40 gallon, if weight is an issue. A larger tank with tiny fish is spectacular. 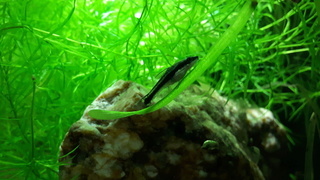 I have a 75 with plants, a few Microctenopoma, some African tetras and some killies, and it is fun to watch. @Fores41 wrote: I wish I had your dilemma Biulu I have a 75 I could set up if I move my other big tank over about a foot just can't convince the wife to let me. Remember Fores that I am only allowed 1 tank in 'sight' as well and that is going to be this new tank. So the current 125 litre is going to be replaced with the new tank and the 20 gallon has to go into the closet. Caoder gave me an excellent suggestion and that is to buy a 4x2x2 foot tank and then a glass lid for a regular 75. This would leave part of the back open for tubes BUT also for putting emersed growing amazon swords thus having a little bit of the mud bucket effect!